Launched in 1992 in Vigevano, Italy by Mario Valentino Braume and Massimo Necchi, Mary Newsletter has carved out their own spot in the progressive rock world, blending psychedelic and classic Italian progressive stylings, plus an assortment of other rock influences to create a sound that defies easy categorization. For their fourth CD, and their third for the Mellow Records label, the band explore somewhat different territory from their previous outings. 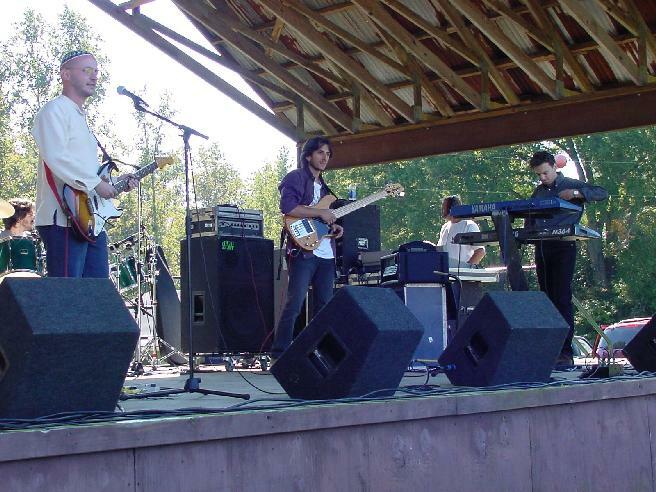 The 1996 debut, Nuovo Lettere was steeped in psych-rock, progressive rock and Blues. And while the band don't consider this to be their first "official" album, I've been following them since this album and and have such a fondness for some of the songs that I can't help but consider it a regular part of the Mary Newsletter discography. Distratto dal sole (1998) retained traces of psychedelia but featured a stronger classic Italian progressive rock influenced sound. And Del Perduto Coraggio (2000) features an outstanding blend of psychedelia, hard rock and progressive rock. From the beginning of L'attenzione Debole's opening track, "Integro", we hear an electronic fused bit that expands upon the new sounds heard on Del Perduto Coraggio. Soon a trademark Mary Newsletter acoustic guitar pattern is introduced, and paired with the electronica has an intriguing effect. But when the full band kicks into the main section of the song we're in familiar Mary Newsletter territory. "Step Forward" is similar in its integration of electronica into the bands riveting brand of progressive rock. Both very powerful tracks. "Il Colpo e la Croce" is a beautifully dreamy song with a spacey, haunting quality that conjures up images of Porcupine Tree with Italian lyrics. The guitar sounds are otherworldly and the pairing of acoustic and shimmering electric guitars on this song is genuine balm for the brain. The piano adds power and intensity to the track, embellished by the soaring space guitars. Definitely one of my favorite songs on the album. The band start to rock out on "…Peccato…", another track colored by ambience and electronic bits, transitioning smoothly into the brief but rocking "Illusione/Delusione". "La Pace" travels tried and true Mary Newsletter terrain, featuring their unique blend of progressive rock, psychedelia and jazz into a tightly knit and completely absorbing whole. Another standout track. And Arlo Guthrie's "Comin' Into Los Angeles" is probably the last song I would have imagined Mary Newsletter to choose to cover, but they take it far away from it's roots, making the song completely their own, utilizing electronica and a pounding sequenced rhythmic pulse, backing the recognizable melody and lyrics of this Woodstock Generation song with something I'll bet Arlo would be mightily impressed with. AI: I understand that Mary Newsletter was founded way back in 1992 by Mario and Massimo. What was your original conception of the music the band would play? Massimo: The original conception of our music has basically been the same from the beginning to today and it's a very simple one: we want to play what we feel to play! We have never thought about a specific direction to follow. We have never said "let's make a song like Pink Floyd", but we just take our instruments (including guitars but even laptops and samplers) and see what happens! Mario: Well, we were really fond of psychedelic rock. When you are nineteen years old and you discover such a great album like "Animals" by Pink Floyd you simply can't stop listening it. Sure we were amazed by the great emotional power they were able to produce with a guitar, for instance. We didn't want to imitate Pink Floyd. We were simply excited by the idea of trying to express ourselves as a "freak out" band. AI: Your first album, Nuove Lettere, was released some years later in 1996. Was the music that ended up on that album similar or very different from what the band had started playing? I really love the mixture of progressive rock and psychedelia with bits of jazz and blues on that album. To this day "Thoughts" is still one of my favorite Mary Newsletter songs. Massimo: "Thoughts" was one of the first songs we started rehearsing together with "A line thru the time" (release on the promo cd "Vigevano in musica") and "Coming into L.A." (in a different version from the one we recorded on "L'attenzione debole"). At that time, Mario and I were listening mainly to Pink Floyd and Jethro Tull, while Davide was very fond of Quicksilver Messenger Service and Jefferson Airplane, so the music we started playing was a sort of mix of these. As I told you this was not an intentional idea, but obviously our tastes influenced, as always happens, our compositions. Basically "Nuove Lettere" was a collection of all the songs we wrote till the moment we started recording it and it was also recorded live, so basically it is a snapshot of how and what we played in that period. Mario: We met Davide Pisi in 1993, and sure he brought us a big heritage from the past (Quicksilver, Jimi Hendrix, The Man band from Wales...). Meantime, Massimo had a great passion for Jethro Tull and Yes. I really loved Led Zeppelin and together we soon discovered progressive music (PFM, Le Orme, Balletto di Bornzo ). We had a good background from the past and we were ready to start from that kind of feeling in order to try and find our way. Nuove Lettere is very similar to the music we used to play in our very first times. Yet it sounds too "vintage", as if we wanted to re-propose the Seventies. That was not the case. Sure we came from that music, but we wanted to go beyond it. But we did record Nuove Lettere in two days, with little equipment. In a way, I guess it was like recording in the Seventies. That's why it sounds so "vintage" and bluesy. Anyway, "Thoughts" was the very first song Mary Newsletter wrote. AI: Distratto dal Sole took you deeper into progressive rock territory, but you still retained the Blues and psychedelic influences, which to my ears helped to make Mary Newsletter unique among the standard crop of progressive rock bands. It's common on the album to hear you moving from jamming blues rock to melodic progressive stylings and then back to the psych blues jams again. Massimo: When we signed with Mellow Records for the release of our first "proper" album, "Distratto dal Sole", we were so excited to have the opportunity to work in a real recording studio that we wanted to realize all the ideas we always dreamed of since then. The result was a sort of over-produced album with 14 people playing! I think there were good songs and some excellent ideas in it, but these were often suffocated by the number of instruments and sounds which played together. I think that, after all, it's a nice album, but with a little more experience with studio techniques some songs like "Cattolica" and "Martiri di curiosit…" could have definitely been better. 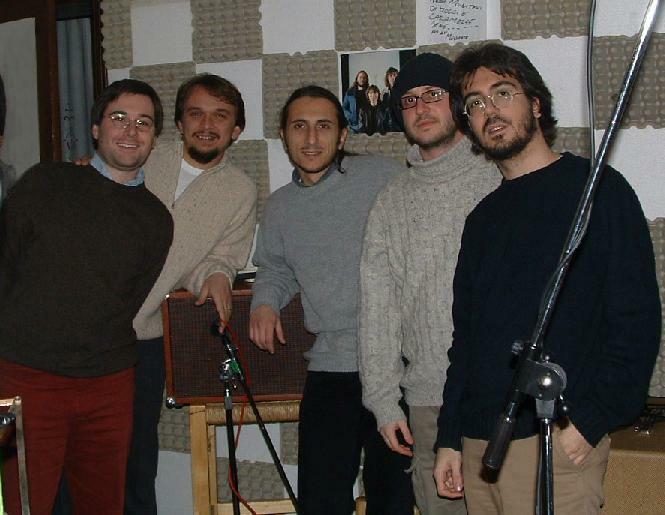 For what concerns our influences at that time, basically they were the same as "Nuove Lettere", since the recordings took place only one year and a half after our first CD. Mario: I think you may find in "Distratto dal Sole" the different propensities of each of us. Massimiliano Galbani liked some kind of melodic songs. Me and Massimo were engaged in finding some psychedelic taste. I think Distratto dal Sole is a set of good songs, but still not perfectly characterized by the "Mary Newsletter style". It was the first opportunity coming from a producer, and I think we did some typical mistakes beginners often make. I think we tried to put into our first Mellow release everything we could. There are guitars, bouzuoki, string quartet, flute, mandolin Anyway, I think it was a good step forward. We began working with Marco Olivotto and, for the first time, we had a look at the opportunities a recording studio can offer. AI: There's a hidden couple minutes of electronic music at the end of Distratto dal Sole that is nothing like anything I had heard from you before. And it's almost like it was a hint of things to come because Del Perduto Coraggio, though still a prog rock album, and in some ways more psychedelic due to lots of ripping psych guitar, but it also incorporates quite a bit of electonica which I thought was a nice addition to your already varied sound. Massimo: Just before the recordings of "Distratto dal Sole" my interest for musical software and samplers began and that "ghost track" was my first experiment with those devices. It had been composed on my computer with Cakewalk by me and Mario with the aid of two of my friends, who are semi-pro DJ's. After this sort of joke I continued to explore the fascinating and always growing world of music software. I bought a used Emu E-64 sampler and tried to experiment with it composing some stuff on my PC using different software. The result of these experiments was a bunch of loops and short ideas. To my big surprise when I let the others in the band listen to this material they liked it and we chose some of them that had the basic ideas for the new songs we started to play. "Ah...ssch! 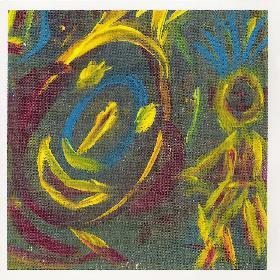 ", "Dovuti effetti di una sola causa", "Andrea Emo nel suo studio" and "Del perduto coraggio" are based on those experiments. The experience of our previous album also lead us to reduce the number of instruments playing together and we deliberately wanted a more "empty" sound. We wanted to avoid the over-production effect, in order to let every sound gain importance on its own. We also had more experience with studio techniques and devices so we started to think to studio procedures in a more artistic way. For example, we used a lot of editing to abruptly change atmosphere. All these things lead to a more intimate, deeper and psychedelic sound to the whole record. Mario: Davide Pisi loves playing music. Sure, me and Massimo also do. But we were extremely fascinated by the technologies and opportunities of digital recording. For instance, you may think song cutting is a boring step in the recording of an album. But we use to think of it as a musical device, a creative opportunity. So Del Perduto Coraggio was composed thinking of the recording studio opportunities. Most of the things-to-do in the recording studios were programmed even two years before the recording itself. We rehearsed the songs thinking of studio devices like an invisible member of the group. Finally, we were ready to let grow up our psychedelic soul, not by imitating Pink Floyd, but finding our way thanks to electronic devices. Massimo became very skilled with computers, sequencers and so on, and we tried to compose a psychedelic album of the 90s. I think Del Perduto Coraggio was a more representative album than Distratto dal Sole. It was extremely funny mixing computer programming together with Blues guitar playing (I refer to the solo of Andrea Emo nel suo studio, or Amica Venus ). We tried to compose a dark, psychedelic, minimalist album. We chose sounds able to drive the listener into a mental trip, as he is always directed to talk with his own consciousness. AI: Your new album, L'attenzione Debole, continues even further in this direction, though I sense a general modern rock feel too. It's very accessible, yet the music is still adventurous and exciting. Would you say this is the result of a natural progression in the bands development over the years? Listening to all the albums in succession it certainly sounds like it. Massimo: Yes, I definitely think there's a natural progression as you call it. "Del perduto coraggio" was a kind of reaction to the over-production of "Distratto dal sole" and "L'attenzione debole" has its roots in the way we composed the previous record. The songs for "Del perduto coraggio" were never played from beginning to end during rehearsals; they were composed always thinking of how we could have recorded them. We played one minute and then another two minutes and then we decided how we could have edited them in the studio. So when we began to compose new songs we felt the need to have a more direct and live approach opposed to the previous album's feel. This is the reason why the songs for the new album have a "rockier" feel. Obviously all the things we experienced before (like loops and electronica, for example) were not thrown away, so the new album includes sounds that can be found in "Del perduto coraggio" too. AI: When I spoke to Massimo at the ProgDay festival in 2000 he said that the band wanted to move further toward psychedelia. Now we have L'attenzione Debole, which is in quite a different direction. Of course ProgDay was four years ago and four years since the previous album and much can happen to a bands direction in that time. Tell me about the bands evolution in the four years since Del Perduto Coraggio. Massimo: Well, that's true... I told you we want to move towards psychedelia. The truth is that you can spend many hours speaking about music but what really counts in the end is playing it. And when we started composing the new songs we "naturally" moved towards a different direction. There was not a predefined plot behind this change. We simply began playing in this more direct way. As I told you, we always play what we feel to play. AI: What are the some of the bands and musical artists that you draw the most inspiration from? Massimo: We slightly changed our musical tastes during these ten years. When we started playing we were very fond of the great bands of the Seventies. We listened to Pink Floyd, Jethro Tull, Yes, PFM and, especially Davide, Quicksilver Messenger Service, Man and Jefferson Airplane. In the last years we moved to more "modern" bands. Personally, I really like Radiohead, Massive Attack, Bjork as well as some Italian band like CSI. AI: Gabriele Scarparo is your new keyboard player but doesn't seem to appear on the album. Marco Gusberti was with the band for a long time. Can we expect any further changes in the Mary Newsletter sound due to Gabriele's style of playing? Massimo: Gabriele joined the band when the keyboards sessions had already been done so he hadn't the chance to play on the new album. The keyboards on the album were played by Marco, who decided to leave us during the recordings for familiar reasons, but mainly by Marco Olivotto, who, above being a great sound engineer and Sonica Studios owner, is a great piano and keyboard player (he released a record many years ago for Mellow Records as TNR). Marco (Olivotto) has been our sound engineer for all our albums with Mellow and he has always had a great role in defining our sound. He gave us many ideas, suggestions and helped us experiencing with all the studio devices. So we have always thought of him as the sixth member of Mary Newsletter. So when Marco (Gusberti) left it was quite natural to ask him to play keyboards and piano on the album. When the album was finished, we began to rehearse in order to prepare our live set and Gabriele had the hard task to learn to play keyboard parts which, in many cases, were written in a style far away from his own. He did a great job and he also began to include his own contributions even for our old songs. Gabriele has a jazzier style of playing and we all look forward to begin writing new material to let him express his playing in a more proper way. Mary Newsletter has always been a very "democratic" band. Everybody is free to contribute to the songs with ideas, so he will surely have a great role in our future sound. Let's wait for a new album! AI: We also have big changes in that your long time vocalist Massimilliano Galbani left the band and doesn't appear on the new album. I can tell from the two songs that Andrea Piccolini contributes vocals on that he brings his own identity to the bands sound. Massimo: Massimiliano left us after the release of "Del perduto coraggio" and before our participation at the ProgDay 2000 festival. Mario sang on almost all the tracks of "L'attenzione debole", but when we began thinking about organizing some gigs to promote the new record it became quite clear that it was too hard for him to play drums and sing at the same time, so I asked Andrea, who I played with some years ago in a sort of post-rock band, to join the band. Andrea is a fan of singers like Mike Patton (Faith No More) and Giovanni Lindo Ferretti (from Italian bands CCCP and CSI) and so he has a style of singing quite different from the usual prog stuff. He joined Mary Newsletter when the new album was not finished yet. The vocals had already been made, but we had two instrumental songs which we were not very satisfied with so we gave him a pre-mixed CD and asked him to try to write some vocals for them. After a couple of weeks Andrea came to the rehearsal with the vocals for "...peccato..." and "in fondo"! Great! AI: It was great seeing you perform at the ProgDay festival in 2000. You did a killer cover of "Astronomy Domine", and I see on the promo photograph I downloaded from your web site that there is a picture of Pink Floyd displayed prominently on the wall behind you, which certainly seems like a strong statement about your influences. But L'attenzione Debole is also a dramatic departure for the band in the choice of Arlo Guthrie's "Coming Into Los Angeles" as a cover. How did you happen to decide on that particular song to include on the new album? Massimo: The story behind "Comin' into LA" is quite interesting: it was, if I'm not wrong, the very first song we started rehearsing ten years ago and it had been part of our live sets for many years (it was dropped out only for the 2000 gigs, including the ProgDay appereance). When we were composing "L'attenzione debole" we wanted to include a "ballad" and we tried to write some stuff, but after some attempts nothing came, so I proposed to record "Comin' into LA". We rehearsed it in a sort of soft jazz arrangement and then we decided it could have worked. But then, when we recorded it, it sounded too "cold" and pointless in a certain way. We were disappointed about that and we really didn't know what to do to solve the problem. I asked Marco (Olivotto) to put all the tracks on a CD-R and then, back home, I worked on my PC remixing them (using the great Propellerhead's Reason 2.5 software). Then I brought the result of this effort to the others and they liked it. So we finally had our version of "Comin' into LA". Now we play it live, but in a once more different arrangement with a sort of noisy dark mood. AI: For those of us who don't have the benefit of speaking Italian, is there a theme to the kind of lyrics on Mary Newsletter's songs? AI: Do you have many opportunities to perform live? How receptive is the Italian public to the type of music Mary Newsletter plays? Massimo: Well, in Italy, but I think almost everywhere in the world, it's quite hard to propose music that is far away from "mainstream". There are some places where you can try to play something "different", but they are not so many, so it's quite hard to have gigs on a regular basis. We don't think that it's a big problem since we prefer to play a few gigs in the right places than to play every night with nobody paying attention to you. After all, music is just a hobby for us, so we don't need to play many gigs in order to earn a living! AI: I saw on your web site that you contributed to Demetrialmente, recorded live in 2000 during a Demetrio Stratos contest. Tell me about this. It certainly sounds like more than just contributing to a compilation. Massimo: Basically it is the live recording of the performances made during the "Omaggio a Demetrio Stratos" contest, which is an annual contest/festival for alternative bands dedicated to the well known Area singer. The CD includes songs by different bands and among them there's our "Amica Venus". The interesting thing about this is that it was the one and only time we played as a trio: Mario (drums, vocals), Davide (guitars) and me (bass, keyboards). AI: Any current activities or future news you care to share? Massimo: Actually we are trying to organize some gigs in Northern Italy and we are also beginning to write some new songs. They are still in a very embryonic status, but they are already sounding interesting. So... stay tuned and check out www.marynewsletter.com for the latest news! For more information you can visit the Mary Newsletter web site at: http://www.marynewsletter.com.